After a period of distraction, the U.S. reaffirms by word and deed its interest in Asia. Let’s face it. Since the departures of National Security Advisor Donilon and Secretary of State Clinton, anyone interested in Asia—whether in the United States or in the region—has been fretting. The new team seemed disinterested at best, inexpert at worst. Yet over the past few weeks, administration officials have unleashed a barrage of Asia-related speeches, commentaries, and initiatives that should reassure all concerned that the region will remain a centerpiece of the new foreign policy team’s agenda. Within the past few days, the administration has also demonstrated a capacity to respond quickly to the mini-crises that are prone to arise in the region. 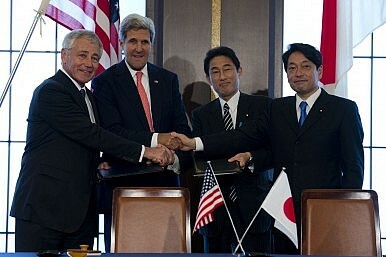 When China announced the establishment of a new East China Sea Air Defense Identification Zone (ADIZ) that incorporates areas already claimed by South Korea, Japan, and Taiwan, Secretaries Kerry and Hagel immediately rejected the Chinese claims and called on China to exercise greater restraint. The rhetorical commitment was followed by a long-planned overflight by two American B-52s within the proclaimed Chinese ADIZ, without notifying Beijing. There are also trips afoot. Vice President Biden will travel to Northeast Asia in early December, and President Obama will follow with a visit to the region in April(probably primarily to Southeast Asia to atone for missing the APEC and ASEAN meetings in October). These visits are both symbolically and substantively important given rising tensions in the region, particularly between China, Japan, and South Korea. What matters most, of course, is not the rhetoric or even high-profile trips but the reality of what is happening on the ground. In her speech, National Security Advisor Rice highlighted the administration’s efforts in Burma/Myanmar. Having just returned from several days there, I can attest to the reality of the administration’s commitment on the ground. In meetings with Burmese businesspeople, officials, and think tank experts, U.S. assistance in the reform process was both acknowledged and appreciated. Much of the credit undoubtedly goes to U.S. ambassador Derek Mitchell, who brings a deft touch to a complicated political situation. As he reiterated a number of times, the United States is ready, willing, and able to be helpful in Burma/Myanmar’s reform process, but at every step, the Burmese must lead the way. If the United States seeks to impose its will, cooperation will fail. So for Asia watchers everywhere, take a deep breath, and in these days of thanks, give thanks to the new U.S. foreign policy team that has not dropped the ball after all. They perhaps just needed a little time to realize that to win the game, they merely need to stay the course. Elizabeth C. Economy is C.V. Starr Senior Fellow and Director for Asia Studies at the Council on Foreign Relations. She is an expert on Chinese domestic and foreign policy and U.S.-China relations and author of the award-winning book, The River Runs Black: The Environmental Challenge to China’s Future. She blogs at Asia Unbound, where this piece originally appeared. US Asia Policy: Things Fall Apart? Vice President Joe Biden trip to Asia this week can’t substitute for sustained attention to the region.